There is nothing like a column or flame shape to add a bit form to a garden. 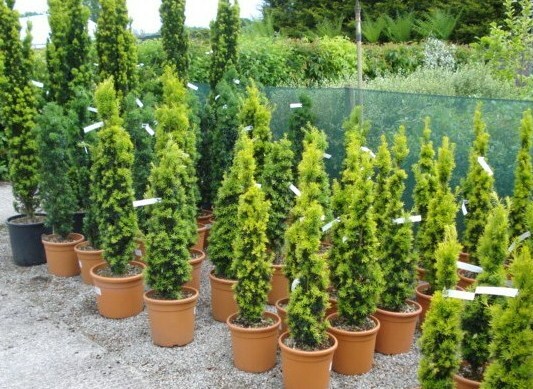 They can be created by clipping Taxus or Buxus and some other plants into these shapes or by using plants that are naturally growing in this form like certain conifers and trees. With any plant you are wanting to maintain to a desired form clipping regularly is essential. Holding plants in this way also makes it important to feed at least twice a year to keep the colour in the foliage. Experience has taught us not to clipp plants when there is a chance of spreading fungus into the cut leaves. So avoid clipping them in wet weather and use clean,sharp shears and clean the shears with a anti-bacterial solution each time you start a new plant. For more help read our recommended book. Topiary for everyone.